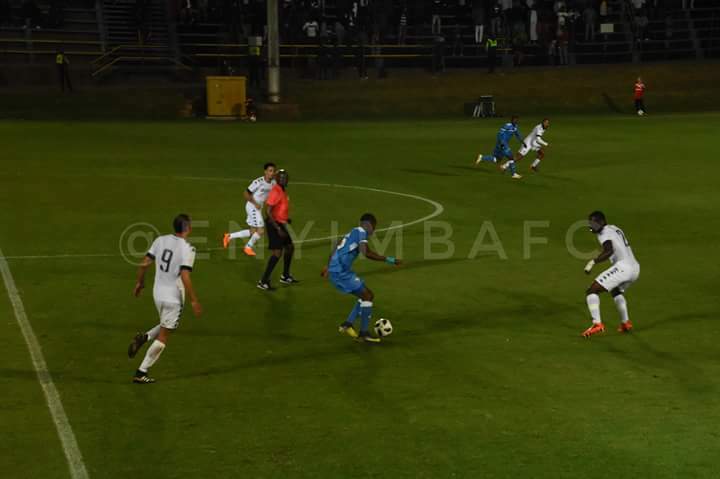 Enyimba weathered a second half onslaught to come away with a 1-1 draw against Bidvest Wits on Friday in Johannesburg. The CAF Confederation Cup 1/16th Round tie pitted Nigeria’s most successful club and two-time African champions against the reigning South African PSL champions at the Milpark Stadium; a draw that promised to be absorbing. It certainly lived up to the billing, right from the kick-off, and even though the scoring was done inside the opening five minutes, the tempo of proceedings did not let up until the very end. Paul Aigbogun made one change from the side that beat MFM FC in league action nine days prior. Benjamin Francis returned to the starting lineup following a spell out with injury, although his comeback would eventually be cut short in the second half. The hosts were keen to make a statement from the get-go, but for all their bravery, they were handed an early lead almost on a platter. A clearance by Nelson Ogbonnaya was inadvertently headed back across the face of goal by defensive partner Isiaka Oladuntoye, presenting Daine Klate with the simplest of finishes at the back post. That advantage was shortlived, however. Just over a minute later. Abdulrahman Bashir played a delightful ball in behind for Ibrahim Mustapha to latch onto, and the striker kept his nerve to slot the ball under Moeneeb Josephs for the equalizer. What followed for Enyimba was a massive rearguard action, led by goalkeeper Fatau Dauda. The Ghana international stuck out a leg to deny Sifiso Myeni at the back stick, before striker Thobani Mncwango twice rose highest in the box to head narrowly wide. Aigbogun’s men came close to going ahead though, midway through the half, after some typically bright work by Bashir. His clever give-and-go with Chinonso Okonkwo opened up space on the flank, but his cross was glanced wide by Mustapha. The second half began with Oladuntoye somewhat atoning for his first half error by clearing a goal-bound effort off the line. That would be the last time Dauda was beaten, as he sprang from his line to deny Eleazar Rodgers one-on-one, and then did it again when the targetman met a near-post cross with a deft flick and a follow-up effort. The result sees Enyimba head into the second leg in Calabar in good stead, with an away goal in the bag. Aigbogun declared himself pleased afterward, saying, “I think the main thing is that you don’t lose.